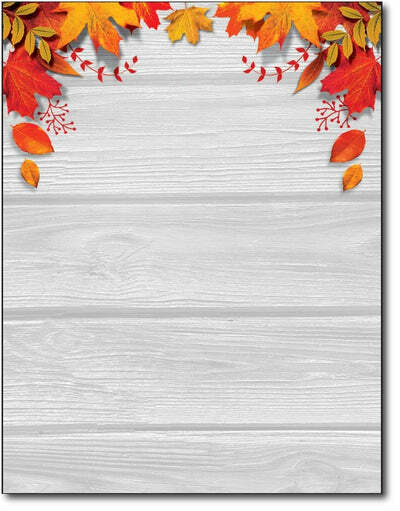 Fall Leaves over Table Stationery Paper by Desktop Publishing Supplies, Inc. captures the beauty of fall as the background for your message. This Fall themed stationery paper features leaves & ferns of Red, Yellow, and Orange around the top border of the paper all over a white wood background. The design is sure to impress! This fall letterhead is made from an above average 28lb Bond paper stock and measures the standard 8 1/2" x 11" size. The design is featured on the front, while the back is plain white. Both sides of the paper are printable with your inkjet or laser printer or copier.